Pre-made kits are made from half round molding stock in 1/2" or 5/8". The moldings are machined from solid, type 304 stainless steel and polished to a mirror finish. *We can custom build a kit to your specifications, in any width or length, from either our Half Round Molding stock or Low Profile Molding stock which is sold by the linear foot. Up to 3 feet is sold at $21/foot. Over 20 feet is $18/foot. The four pictures below are examples of end configurations for the moldings. Diagonal is also available. Mounting studs are recommended for door panels and applications outside of your ride. The studs are $5 each and one is pictured below. 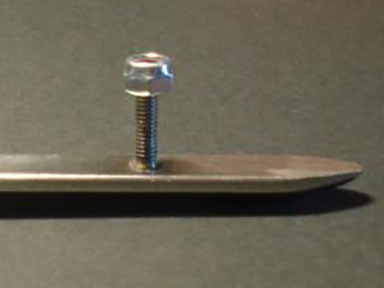 This is an example of a 8-32 stud on 1/2" moldings. The 6-32 studs are used for the 1/4" moldings. Studs are $5 each. Low profile moldings offer a lower height profile than the standard half round moldings. 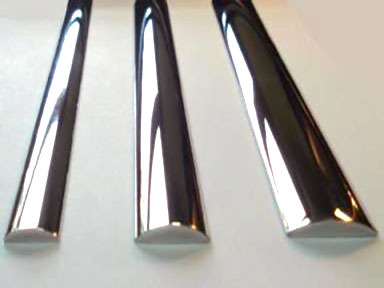 They are solid, type 304 stainless steel and polished to a mirror finish. Options for end configurations include the same as the half round. Recommended studs are an 8-32 x ¾" and are $5 each. Includes six pieces: (2) 42" and (4) 36" polished stainless steel half round strips with 3 studs installed on each strip. ***Other lengths available; call for pricing. 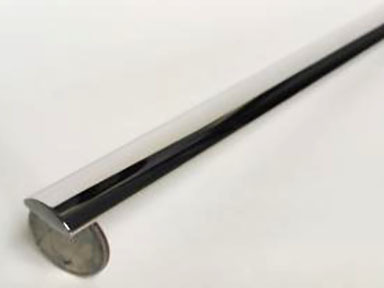 The universal running board kit will fit most 1936 - 1940 Fords. Other vehicles too: 1931 Chrysler Imperial Sedan, 1933 Chevy Coupe, 1935 Plymouth, 1937 Chevy Truck, 1937 Chevy business coupe plus others. Please measure prior to placing the order. Includes six pieces: (2) 36" and (4) 32" polished stainless steel half round strips with three studs installed on each strip. 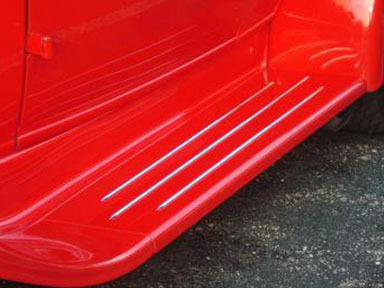 These fit shorter running boards including Model A's and '32 Fords. 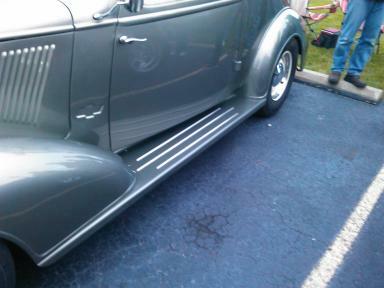 The 1935 Chevy could be either the short or universal kit.